IronYi........: Cupcakes and more cupcakes! So I kicked my daily Starbucks habit this week but apparently, I've replaced that with a daily cupcake habit but no worries, shortly, I will put the cupcakes down and start the training! But the way to a gal's heart? A red velvet cupcake from Sprinkles! Hmmmm..yum! 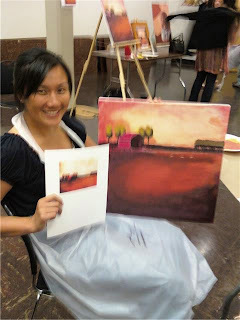 I've also picked up a new skill to balance out the multi-sport life...painting! My friend Mike put on a great event Saturday evening and what a fun and therapeutic art event he put on! Anthony and I decided to sit next to eachother since neither of us inherited the art genes of the family. I was wrong. He didn't inherit the art genes..I got some of them! Ha! Just kidding. Neither of us did as badly as we thought we would. Everyone had fun..it was good times! And what's a weekend without triathlon? Went to watch the inaugural Marin Triathlon and cheered on some friends who raced. Wonderful weather conditions, good company, good times, free food, awesome! Speaking of triathlon..one cool Ironman Kona Video! Yes, the soundtrack made the video extra cool and added to the drama!